Knowing the pH of a soil is very crucial before planting is done on such soil because it determines the type of crop that will grow well on the soil. Laboratory is the best place where this test can be carried out but it is expensive and not easily located. Recent research as shown that soil pH can be determine manually without going to the laboratory and the result derive is conclusively equal to that from the laboratory. Litmus paper is a pH sensitive paper used to determine the acidity and alkalinity of a substance. It comes in pairs, a red and blue litmus paper. Red litmus paper turns blue under alkaline conditions while blue litmus paper turns red under acidic conditions. To use the Litmus paper determine soil pH, get the sample of the soil to be tested inside a container, add distilled water to it so that it looks slurry or form paste. Insert the Litmus papers and observe the change in colour. If the red limus paper turns blue it means the soil is an alkaline soil and if the blue turns red, it means the soil is an acidic soil. These two materials are common materials used in food industries; they are both sensitive to both acid and alkaline. They can be used to determine the pH of a soil. To use these materials to determine soil pH, collect the soil sample to be tested, divide the soils into two portions and pour each in a plastic. Add half cup of Vinegar into one sample, if it effervesces (that is it brings out rapid bubbles) it means the soil is alkaline with pH ranging between 7-8. To check if the soil is acidic, add distilled water (This is the water gotten from the cooling of the water vapour that evolves when you boil water or can also be gotten from chemist shops) to the other sample until the soil gets muddy, add half cup of baking powder to it. If it fizzles out bubbles, it means the soil is acidic with pH ranging between 5 and 6. However, if the soils did not react at, it means it is neutral. Red cabbage is a common vegetable; the solution from the cabbage can be used to to determine the pH of any substance it comes in contact with. To determine the pH of the soil using these materials, the red cabbage is chopped into pieces with a knife. 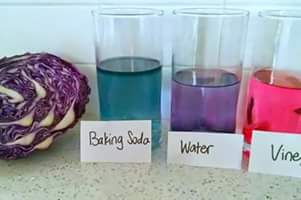 Boil the distilled water and later add the chopped red cabbage, allow it to soak for about 20 minutes before you evacuate the solid particles of the cabbage leaving the purpe-coloured liquid, with a neutral pH. Pour the liquids into two different cups, divide the soil to be tested into two with each portion in different cups, pour little quantity of the liquid into little quantity of the soil like 2 full teaspoons. Wait for about 40 minutes to observe the change in color. If the mixture is purple in colour, it means the sand is neutral with a pH of about 6.5-7. If the mixture turns pink, it means the soil is acidic with a pH value of between 1-7, the brighter the pink colour, the more acidic the soil is. If the mixture turns green it implies that the soil is alkaline with a pH value ranging from 8 – 14, the brighter the green color the more alkaline the soil is. NOTE: Accurate result is gotten with the use of distilled water because distilled water is free from ions that can react with the solution, thus, hindering the result to be gotten from the test. I really enjoyed your post,very educative. Can we work together sir?